Lot 6.44 & 6.45, Level 6, Pavilion. Monday to Sunday, 10.00am to 11.00pm. There’s a restaurant at Straits Quay, Penang. SPASSO Milano’s fresh look in the way its interior is dressed up, portrays a contemporary, stylish and elegant setting that is certainly not stifling. Having moved from its previous location in Ampang, co-owner Irene Lim said the new open concept ambience, was decidedly different from its previous setting that was often perceived as a fine dining spot. 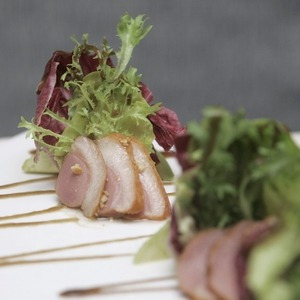 Fresh: Sliced home-smoked Duck Breast and Avocado drizzled with Hazelnut Oil. “When we shifted to Pavilion Kuala Lumpur, we adopted a more relaxed look and incorporated the retail dining concept. At Spasso Milano, the idea is to entice the diner to feel at home as culinary delights featuring Italian home cooked favourites flow from head chef Felice Martinelli’s kitchen. While diners sit back and sip a glass of Prosecco, the island in the middle, bustling with movement comes into view as the kitchen crew prepare cold cuts, grilled items and desserts, here. An added difference to the new home of Spasso Milano is its retail-dine concept and its decision to go non-halal. In shelves overhead and near the island are specially sourced Italian gourmet items, available for purchase. Some of the things to look out for are ham, cheese, breads, pasta, teas, jams, balsamic vinegar, extra virgin olive oil and wines. 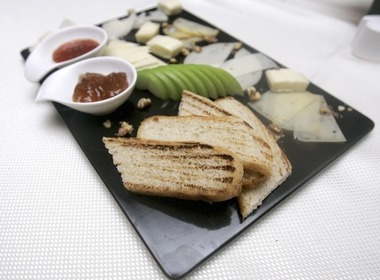 Wide array: Cheese Platter – choose from any four types – (gorgonzola, fontina, Taleggio,smoked scarmoza, provolone and pecorino)served with sliced apple, walnut and grillled focaccia. Chef Felice stays true to respecting the ingredients and observes techniques required in whipping up a true Italian dish. For example, only specialty handmade Prima Pasta made from 100% durum wheat flour is used. Lim said the imported pasta is sourced from abroad as its handmade quality gives it the essence of country style cooking, done to perfection. Our first introduction to the range was the Al Pesto (with Fileja Prima Pasta) with basil, extra virgin olive oil, pine nut, Parmesan and Pecorino. A plate of little fat bead-like pastas, coated in pesto sauce, garnished with basil, fine shaves of pecorino and Parmesan, toasted pine nuts and extra virgin olive oil arrived at the table. The pasta, cooked al-dente was firm and rich in sauce, clinging on to each pasta bead as we enjoyed the uncomplicated flavours of this presentation. The Risotto Alla Monzese smelled and tasted of saffron as the yellow scamble of risotto with pan-fried Italian sausage, quickly won over our palates. 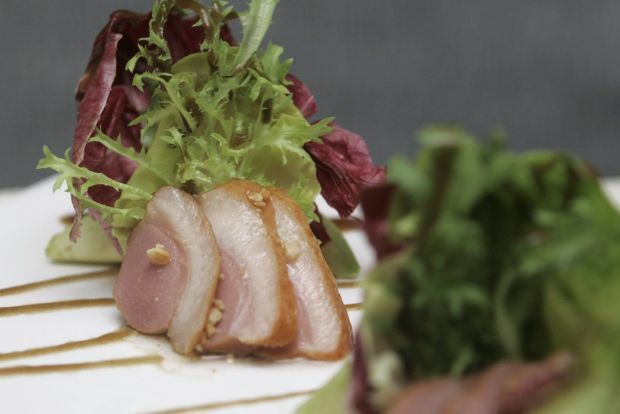 I truly enjoyed the Smoked Duck Breast with slices of home smoked duck breast layered with avocado was lovely with a drizzle of hazelnut oil to accentuate its flavours. Then there are the pizzas, that are as original as they can get. Made using a traditional wood fire pizza oven imported from Italy, the pizzas are thin and crispy and a sheer delight to savour. I was told that to deliver an authentic Italian pizza, its base has to have a certain crispness and is incredibly thin. The real deal besides the crust is in the subtle incorporation of herbs and toppings on the pizza. Our party of five savoured the Scamorza Affumicata and Speck Pizza, as the pizza offered heady smoked flavours of scarmorza cheese and smoked air-dried ham. The Pork Valdostana is a house favourite with Fufilli Aglio Olio, pork escalope with baked ham and Fontina cheese, a enjoyable dish for those who can’t get enough of pork. We were also treated to a cheese platter of gorgonzola, fontina, Taleggio, smoked scarmorza, fontal, provolone and pecorino alongside a serving of sliced apples, walnut and grilled focaccia as well as the addictive and tasty, Fichi India and Crema al Peperocino Jam. I found the adventure of tastes with the cheeses simply fascinating and quite educational. When it was time for dessert, we lavished in the Chocolate Lava Cake with Vanilla Ice Cream, Millefogile with Mascarpone Cream and Panna Cotta with Mixed Berry Coulis. The restaurant’s lunch deal is a great way to get acquainted with what’s on the menu because for RM28++, there’s the anti-pasti lunch buffet with antipasti, salad, soup, dessert and Roast of the Day. Sure, we had dined in a classy Italian restaurant in Kuala Lumpur but the spread before us, could have just as well been in a restaurant somewhere in Milan.